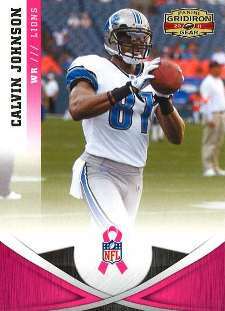 In conjunction with the NFL's involvement with Breast Cancer Awareness Month, the Professional Football Hall of Fame store in Canton, Ohio is offering a free set of Panini trading cards. The 64-card set includes two players from each team. The design is based on a pink variation of the upcoming 2011 Panini Gridiron Gear Football. To be eligible to receive the free trading card set after shopping at their online store, simply enter the promotion code CATCH11 during checkout. The cards will only be available for a limited time. In addition, 20 percent of your entire purchase will be donated to the Susan G. Komen Foundation. Cards from the set will also be given away at games and inserted in Gridiron Gear packs.